Beef ribs braised with potatoes, a dish that does not claim to originality, but great for a delicious and hearty lunch with the family. 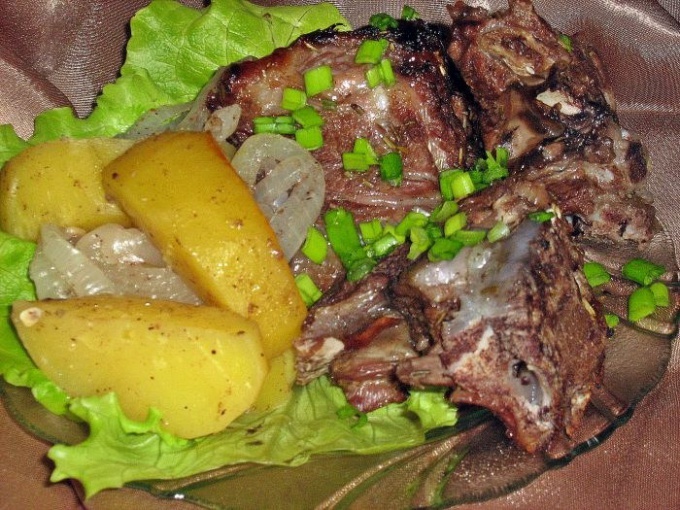 Because okolokozhnoe meat has a special taste, due to which the food is incredibly rich and flavorful. For cooking you will need about 1 kg beef ribs, 1 kg of potatoes, 2 carrots small size, 2 heads onions, rosemary, Bay leaf, pepper, salt, to taste, a few cloves of garlic, fresh herbs. The ribs a good rinse in warm water, dry it with a cloth, remove all streaks and films, cut into serving pieces. Take a deep large frying pan, heat it with vegetable oil, place ribs and cook on all sides until they will not appear appetizing crust. Put all in a pot, pour water, add salt, pepper, add the rosemary, cover and leave to stew on low heat until then, until the meat begins to move away from the bones. While stewing, add some water as it evaporates. Peel onions and carrots, rinse. Finely chop onions, carrots cut into circles, fry the vegetables with oil until Golden brown. Put in a container with edges. Try the soup for salt, if needed, a little sunflower and add spices to taste. Potatoes also peel, wash, dry, cut into cubes of medium size or just cut into four pieces, place in a saucepan. Add the Bay leaf, continue to simmer on low heat until potatoes are done. Everything is ready, before serving, sprinkle with melkorublenoy greens in each plate put the garlic cloves. To cook a dish and pot, in this case, reduce the use of oil and the food will remain hot. Fry the ribs until cooked, place them in a bowl, in the remaining oil saute the onions and carrots. On the bottom of the pots put a little vegetable frying, put on her ribs, potatoes, and on top of the remaining fried vegetables. Add salt, pepper, cover with water to 2/3 of the entire depth of the tank, place the pots on a baking sheet, place in a preheated 200 degree oven for 40-50 minutes. Serve in pots, each, add the garlic cloves, sprinkle with herbs. If you want the recipe you can modify to add their own original ideas and additions. For example, you can use eggplant, tomatoes, bell peppers or even zucchini. Ribs can take pork or lamb to your taste, but they are more spicy and aromatic for two hours before cooking to marinate them with spices and garlic.